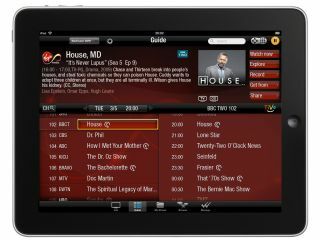 Virgin Media's TiVo iPad app - coming soon? Virgin Media has sent us a sneak peek at its upcoming TiVo iPad app. Sadly, the spoilsports won't tell us when the app will be released, exactly what it will do or any other handy hints about it at the moment. We already know that the app will act as a massive remote control as well as a lap-based EPG. But looking at the first screen shot, it looks as though we can also look forward to multiroom DVR management, on-demand content on your iPad and some social features via the 'share' option. We wouldn't be surprised to see some Facebook or Twitter integration here, and it'd be nice if it went a little bit deeper than simply tweeting what you're watching. TiVo already has an iPad app out in the US, which, based on the picture Virgin Media sent us, doesn't look massively different to the upcoming UK one; but with Virgin on board, we're hoping for some nice little extras to sweeten the deal.